2012 has arrived! Happy New Year! Did anyone else wake up this morning searching for the Rose Parade on TV, but didn't find it? It took me about half hour to figure out that when new year's day falls on a Sunday, the Rose Parade and Rose Bowl actually take place on Monday. With no Rose Parade to watch I decided this was the perfect time to bake the first Club: Baked recipe for 2012, Devil's Food Cake with Angel Frosting. For those of you who don't know, Club: Baked is an online baking group where a group of us are baking our way through the book Baked Explorations by Matt Lewis and Renato Poliafito. The group was founded last July by Karen of Karen's Cookies, Cakes and More. The group bakes twice a month. Each week we all make the same recipe which is selected by that particular week's hostess. So far we've baked some pretty awesome treats. A few of my 2011 favorites have been New York Style Crumb Cake, Buckeyes, Sunday Night Cake, the pastry cream from the Boston Cream Pie recipe and the Caramel Apple Cake. You can join us on our baking adventure by getting in touch with Karen via the Club: Baked site. The more the merrier! A few baking notes. The cake recipe calls for hot coffee, however I'm not a fan of coffee in my desserts (even though people swear the taste is undetectable in the final product--I can always taste it). So instead I dissolved 1 teaspoon of cocoa powder with hot water. It worked out fine and the cake still had a deep chocolate flavor. I made mini cupcakes and they took about 17 minutes in a 325 degree oven. I was worried I would have trouble with the frosting. I have had some failed attempts in the past with frostings that call for a hot sugar mixture to be streamed into the frosting. I followed the recipe exactly and I was pleased to see that it came together easily with no issues. To see how other Club: Bakers cakes turned out click here. Here's to 2012! I'd like to raise a cupcake to toast the start of a great year! Preheat oven to 325 degrees F. Butter two 8-inch round cake pans, line the bottoms with parchment and butter and flour the pan, including the parchment, discarding excess flour. Or make cupcakes by placing liner in the wells of a muffin tin. Place the cocoa powder and chocolate pieces in a medium heatproof bowl and pour hot coffee over them and whisk until combined. Add the milk and whisk until combined. In a medium bowl sift together flour, baking soda and salt and set aside. In the bowl of a stand mixer fitted with the paddle attachment, beat the butter and 2 kinds of sugars on medium speed, about 3 minutes, until fluffy. Add the eggs one at time, beating until each egg is fully combined. Add the vanilla and beat until incorporated. Scrape down the bowl and mix until for another 30 seconds. Add the flour mixture in three parts, alternating with the melted chocolate mixture. You should begin and end with the flour mixture. Divide the batter evenly among your cake pans or cupcake liners. If you are making cakes, bake for 35 - 40 minutes, rotating the pans halfway through. If you are making cupcakes, bake 18 - 20 minutes. Test your cake or cupcakes with a toothpick. If it comes out clean they are done. Remove from oven and cool on a wire rack, until cakes or cupcakes are mostly cooled. Place the egg whites in the bowl of a stand mixer fitted with the whisk attachment and set aside. In a medium saucepan combine 1 1/4 cups of the sugar, the corn syrup and 1/4 cup of water and place over low heat. Once the sugar dissolves increase the heat to medium-high and attach a candy thermometer to the side of the pot. Heat the mixture WITHOUT STIRRING, to almost a soft-ball stage (about 235 degrees). Mixture should not be heated above 235 degrees F.
While you are waiting for the syrup to reach the softball stage, whip the egg whites on medium speed until soft peaks form. Do not beat beyond the soft peak point. When the syrup mixture reached the soft-ball stage removed from heat. Sprinkle remaining 1/4 cup of water over the soft peak of the egg whites and turn the mixer to low. Slowly stream in the the hot sugar syrup. Once all the syrup has been added, increase the mixer speed to medium-high and beat the icing for about 7 minutes until it is thick and shiny. Add the vanilla and beat again until combined. For cakes: place one layer on a serving platter and trim the top to create a flat surface. Spread about 1 cup of frosting on top. Place the second layer of cake on top and trim to create an even surface. Frost the tops and sides of the cake. Serve immediately. 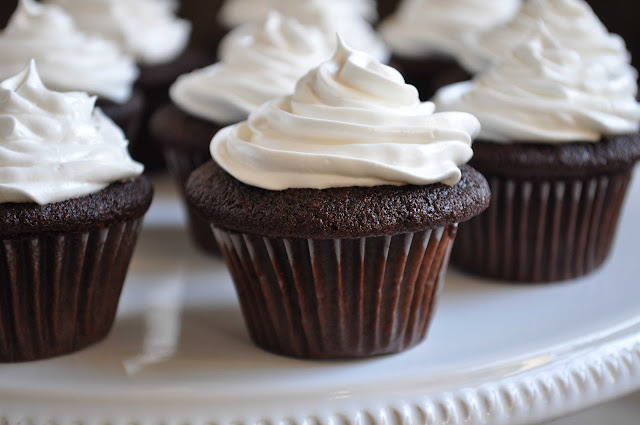 For cupcakes: Simply top with frosting. 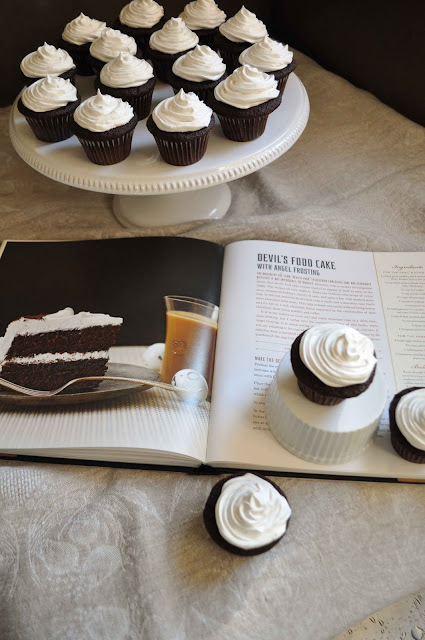 You can you use a decorative tip to pipe on the frosting or use a knife to spread it on. For even more frosting, cut a cylinder shape out of the middle of the plain cupcake and remove the cake. Fill with frosting (using a piping bag or a ziptop bag with the corner cut off) and replace the cake that you removed. Proceed with frosting the top of the cupcake. What beautiful cupcakes. I'll have to try the chocolate cake from Sweet Melissa. I need a good chocolate cake recipe. Your cupcakes look great! I didn't get to bake along this time, but it looks like I am going to have to try this recipe, especially the frosting. Also, your pictures look so good! Your cupcakes are so pretty! Love your pics!!! Happy 2012!! Your cupcakes look amazing! I was happy to find the Rose parade wasn't on yesterday when at about 2:00 I realized I'd missed it only to find it was on today! So that was what was missing: The Rose Parade! Same here. Anyway, your cupcakes are wonderful....they look like little chocolate pots with vanilla rosettes. Felt bad about missing the parade, i'll find a replay somewhere in the net...Thanks for posting! I am not much of a chocolate girl, but that frosting looks wonderful. Great photos. I can't watch the Rose Bowl parade - I get too jealous about the gorgeous weather :) Your cupcakes look fantastic! I haven't made cupcakes in forever and your pictures have me craving them in a big way. This Angel frosting is so pretty and dainty looking. A belated Happy New Year to you! 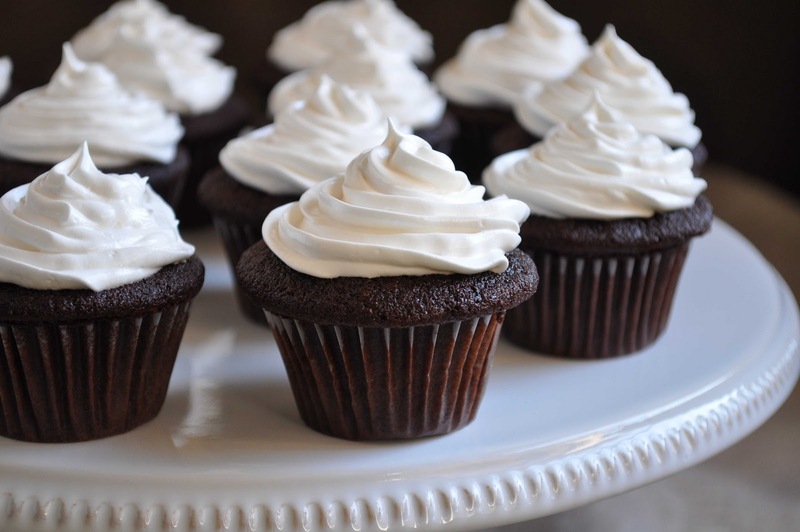 Your cupcakes look just perfect. I love how you piped on the frosting. I missed the chocolate cake you mentioned from the SM baking book and will have to give that one a go, hubby's birthday is at the end of January and he likes chocolate cake so possibly then, if not sooner :) Love the sounds of this frosting with a lemon cake, yum!